A Black actor took to social media to detail a horrific racist attack with a glass bottle on social media. But it’s what the attacker said to him that’s most disturbing. “I am sad that she feels such hate, that she lives with hate,” wrote Marius Makon, just hours after a racist attack on March 4 that left blood streaming down his face. An immigrant from Cameroon, Makon is a professional actor who also goes by Elton Prince professionally. Makon said that he went out with a group of friends in Madrid for coffee early Saturday morning. When they arrived at the coffee bar, a woman approached him. Makon reports that he asked the woman to calm down, and that’s when she began attacking him with a glass bottle. Mason said his attacker hit him twice on the head, causing cuts and bruises. But the woman’s vicious words during the racist attack cut even deeper. Makon uploaded his photos of the racist attack to Facebook showing the wounds that resulted in him needing seven stitches to close the wounds. “Now I am in my house and I look through these images [of his injuries] I do not feel any hate towards the woman,” Makon asserted on Facebook. “I want to say that I am not angry with her and I don’t know why. I am sad that she feels such hate, that she lives with hate. It saddens me that she does not enjoy life, that she doesn’t leave a small space in her heart to love. The restaurant owners of X Privado then called the police, reports The Washington Post. Authorities arrived, detained the woman for a few minutes, and then released her after she gave a statement. The Spanish Immigration and Refugee Support Network have reported the incident as a hate crime and asking Madrid prosecutors to pursue an “immediate” sentence. 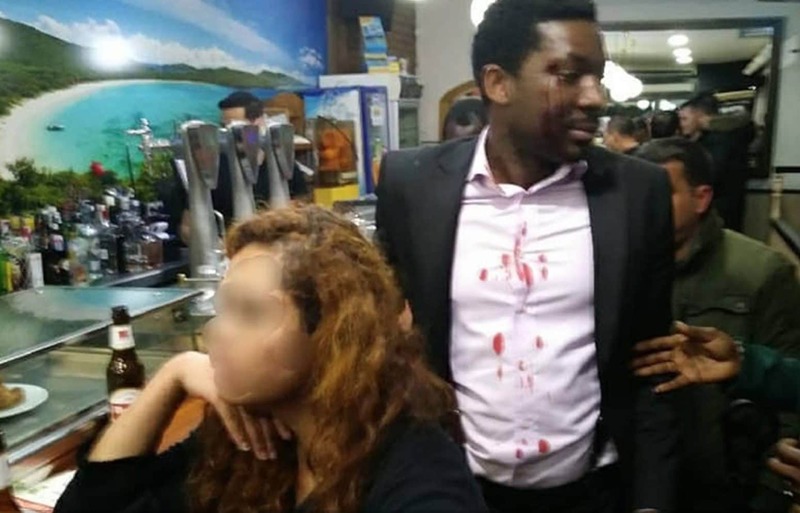 According to El Pais, the racist attack on Makon comes a week after the Council of Europe released a report urging Spain to create an independent anti-racism body. Spain and the micro-state of San Marino are reportedly the only members of the 47-strong Council that still lack an organization designed to tackle racism.